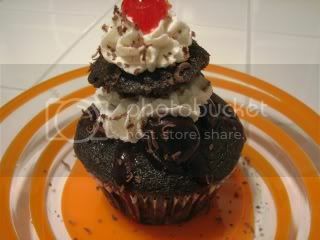 And now I present to you, the cupcake of the night! 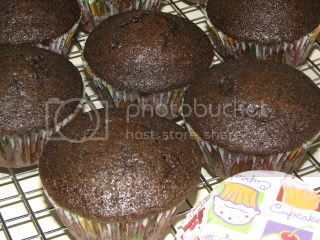 You start out with the same base chocolate cupcake. For this round, I bought Organic Cacao Chocolate Powder to see if it improved the tast. I am sorta bummed that I bought these super cute cupcake wrappers and you can’t even see them. I put one on the cooling rack upside down so you can see it. You also use the same Fluffy Vanilla Butter Cream Frosting as before. However, I do not use shortening, only butter and I 1/2 the recipe. The addition to this cupcake is making up some sweet dark cherries in a pomegranate sauce and doing a super cool decorating technique. You scoop out part of the cupcake to use in building your cupcake tower. 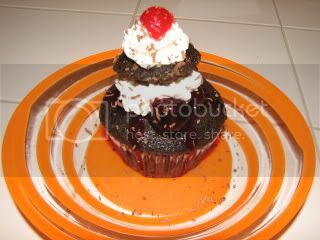 Then, it’s just a matter of layering fluffy butter cream, cherries, chocolate cupcake and candied cherries with chocolate shavings. I actually haven’t tasted the cupcake as The Husband inhaled this one. I am however carting everything to work tomorrow to share 😀 I will give you a review then. The Husband did devour it pretty quickly and said he like it for not liking chocolate and fruit together – once again, he’s funny! I am off to do some yoga, shower, and get caught up on some sleep. Night all! They look gorgeous and delicious. I can’t wait to hear what you think. OMG these were EXCELLENT. I love chocolate and it was delicious. The cherries was actually the best part. The cake is not too sweet, which is great. My three boys tried them out and loved them as well.